During the end of summer most trees slow their growth. As a general rule, trees do not grow when the temperatures are above 90 degrees. However, the beginning of September ushers in a completely new season. At this time the evenings are beginning to get cool and summer is on its way out. The trees love this and we apply the last end-of-season feeding to our cold-hardy trees. September brings another growing cycle almost as strong as Spring. Psychologically you may feel that summer is over, but actually the growing season will extend for another six weeks. It’s important not to miss this growing period. At the same time, watch closely in case of an early freeze starting around the third week of September and preparations should be made to bring all indoor trees in for the winter. 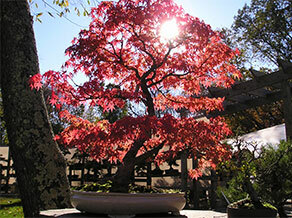 While this is also the last chance to do repotting, our golden rule is to leave our bonsai alone until next spring. Even though at the nursery we take advantage of this small window to repot in the fall, it’s a dangerous thing to do if you do not have greenhouse conditions to make sure roots develop well before the very cold weather. I do love my trees in September; the stress from the summer heat is off and the nutrients from our late August fertilizing are kicking in. Them the color is especially vibrant on all trees. 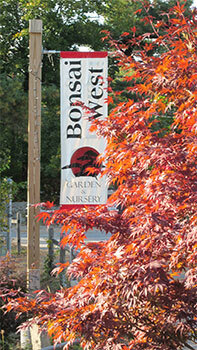 Maples are beginning another push of foliage and in no time will be showing off their fall colors. Junipers are a deep lush green as are the azalea, next year’s flower buds are beginning to swell and the new late summer leaves are at their peak of health. 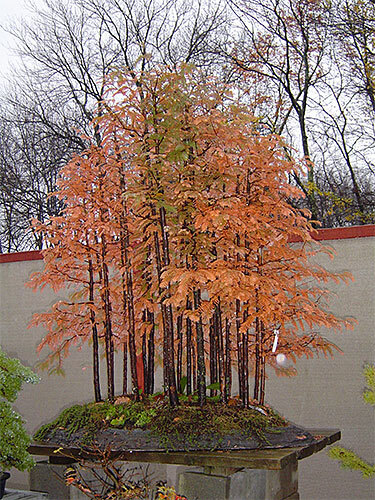 I’m always amazed at how beautiful bonsai are in the fall. No wonder many of the famous bonsai shows in Japan are in September. Be sure to leave long branches on deciduous trees if you are trying to fatten them – this is the time the sap retreats and branches thicken. Be sure to check for old wire and remove it in order to prevent scarring. Do not remove brown scorched leaves on deciduous trees such as maples; it’s best to let the new buds push them off all by themselves. Mineral deposits from city water often builds residue on the bark and roots. Use a hard toothbrush or wire brush to clean the lower trunk. Be on the lookout for the start of the rainy season and change your watering habits accordingly. Consider moving your maples to a sunnier location now that the days are getting shorter and don’t water too late at night to prevent powdery mildew from forming. Most tropical trees are fine outside down to 40 degrees. Watch closely in case of an early freeze during the third week of September and preparations should be made to bring all indoor trees in for the winter. Winter Hardy trees are fine outdoors until the third week in November. But start preparing your winter dormancy location now! A bulkhead or unheated garage often is all you need, and if you have rodent problems such as mice start putting bait out now. Remember: some cold hardy trees such as chinese elms, trident maple, and azalea may need extra protection. Find a good sunny location in your home for your tropical trees, and inspect them carefully for insects. There are many systemic insecticides on the market that work well in the soil as a preventative measure. No heavy pruning should be done at this time but do give a quick snip to elongated branches. You will notice some dropping and yellowing of leaves after bringing plants indoors because of the lower light, especially as the days get shorter. Consider a good grow light such as an Ott Light® to supplement natural daylight. Cut back on water and fertilizer, but of course check trees everyday to prevent a dry-out. Remember to water only when the tree is beginning to dry and from now on through February, feed only once or twice.